Be Invincible! 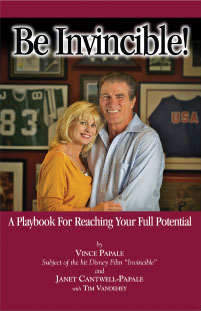 A Playbook for Reaching Your Full Potential by Vince Papale and Janet Cantwell-Papale with Time Vandehey. 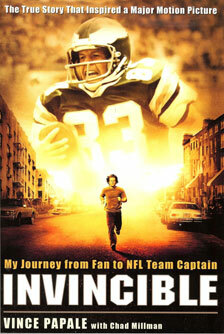 Vince’s first book: INVINCIBLE – My Journey From Fan to Team Captain was a critically acclaimed success. Co-written by ESPN the Magazine Editor Chad Millman (The Detonator & The Odds) Vince fills in the cracks and tells in great depth his incredible journey that was documented by the Disney box office hit INVINCIBLE. There is much more to his story that is depicted on the silver screen as Vince’s success was tempered by a complicated family life, a past, that continued to haunt him, even as a hometown hero. At its core INVINCIBLE, the movie and the book, is an underdog story that will inspire others to pursue their dreams too. In 1976 the fans of Philadelphia were looking for a motivating hero and now more than ever they need someone to look to use as a champion. YOU CAN BE INVINCIBLE IN TOUGH TIMES … ANALYZE, ADAPT, & ACHIEVE. In it he will share his formula for success with Papale’s Playbook, Improvise & Adjust, White Knuckling It, and dozens of other tips for coping with everyday challenges. Once again Vince will re-invent himself as an author and provide for those with a vision the motivation and incentive to hold fast to their dreams.